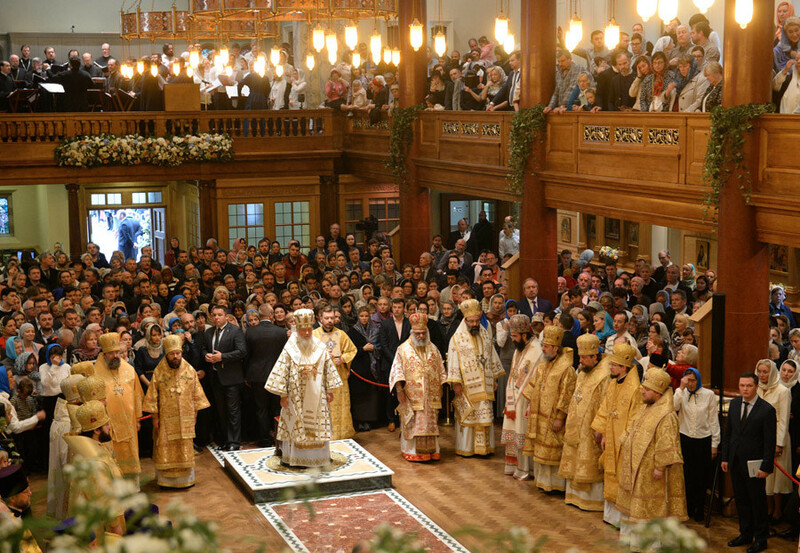 Hundreds of people including the Archbishop of Canterbury and Prince Michael of Kent gathered in London’s Cathedral of the Dormition of the Mother of God and All Saints to attend a historic service conducted by the head of Russia’s Orthodox Church. 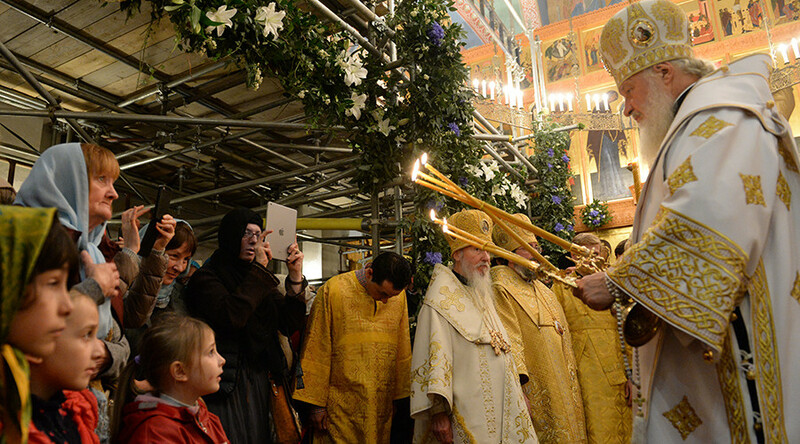 Up to one thousand people attended the ceremonies on Sunday, according to the patriarch’s press service. 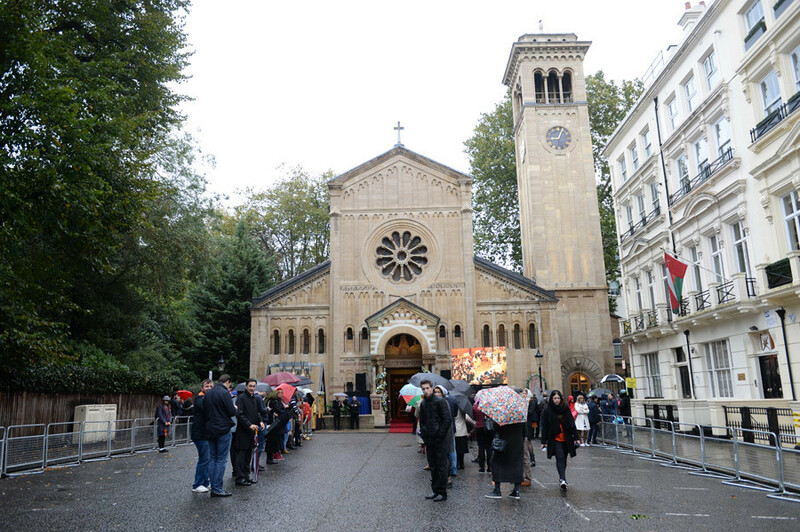 The service included the consecration of London’s largest Orthodox Christian Cathedral, which had undergone a major refurbishment, and the Divine Liturgy, commemorating the 300th anniversary of the presence of the Russian Orthodox Church in the British Isles. During the service Patriarch Kirill prayed for “all the Saints who shone forth in the British land” and dedicated the Orthodox hymn “Many Years” to Her Majesty Queen Elizabeth II, the United Kingdom and Russia. After the Service, Patriarch Kirill addressed the people who gathered for festivities, emphasizing that both the Russian Orthodox Church and the Church of England play a critical role in international relations and peace building, even under the current political circumstances. “The Church is a community open to everyone, [it] erases all human controversies. Even a very rich man stands next to the poor one, high-ranking officials stand next to the common people. The Church should also play a role in international relations. Through faith, through the church the soul of a nation is manifested,” the patriarch said. “These two nations connected by centuries-old history know and respect one another. Hopefully this potential will develop further for a better future in the relations between our peoples,” the patriarch conveyed. He remembered with gratitude Anthony of Sourozh, the founder and for many years bishop – then archbishop, then metropolitan – of the Diocese of Sourozh, the Patriarchate of Moscow's diocese for Great Britain and Ireland. The patriarch said that he helped the residents of the British Isles understand Russian Orthodoxy and focused on improving the relations between the Russian Orthodox Church and the Church of England. Patriarch Kirill also commemorated the reunification of the Russian Orthodox Church Outside of Russia (ROCOR) and the Russian Orthodox Church. The two reunited in 2007 after 80 years of separation following the 1917 Bolshevik Revolution. "The London community has mirrored the most difficult time in the history of our country and our church," Patriarch Kirill stressed. Among hundreds of attendees, Prince Michael of Kent, first cousin of Queen Elizabeth II, attended the holy Service. He is distantly related to the Russian royal Romanov dynasty, shows a great interest in Russia and takes part in a number of charitable projects. Archbishop of Canterbury Justin Welby and the Bishop of London Richard Chartres also attended the events, along with representatives of the Roman Catholic Church and the UK’s local Orthodox Churches, the Diocese of Sourozh and parishes from different parts of England, Scotland and Ireland, senior British officials, members of parliament, as well as ambassadors. Some 900 invitations had been handed out prior to the event, but when the Service started, anyone who wanted to attend the service was allowed to enter. Patriarch Kirill is to spend four days in London. It is his first visit to the UK in his current role. It’s also the first time in 25 years that the Head of the Russian Orthodox Church has visited the country. Prior to this, Patriarch Alexy II, Patriarch Kirill’s predecessor, visited the country in 1991, and prior to him the then-First Hierarch of the Russian Orthodox Church, Alexy I, visited the UK in 1946. During his trip, the patriarch is scheduled to meet the local Orthodox congregations and representatives of the Orthodox Church, as well as Queen Elizabeth II at Buckingham Palace and the Archbishop of Canterbury. Following Sunday’s Service, Archbishop Welby told the press he considers his upcoming meeting with the Head of the Russian Church highly important, adding that there have been some difficulties with respect to current events, which they have been discussing over the last few years. But he was absolutely convinced that God is able to improve relations between the United Kingdom and Russia, Archbishop Welby said as cited by TASS. Father Georgy Sergeev of the Russian Orthodox Church told RT that the major point of the Patriarch’s visit is to celebrate the events historically important to the Russian Orthodox Church in the UK with its British congregation. 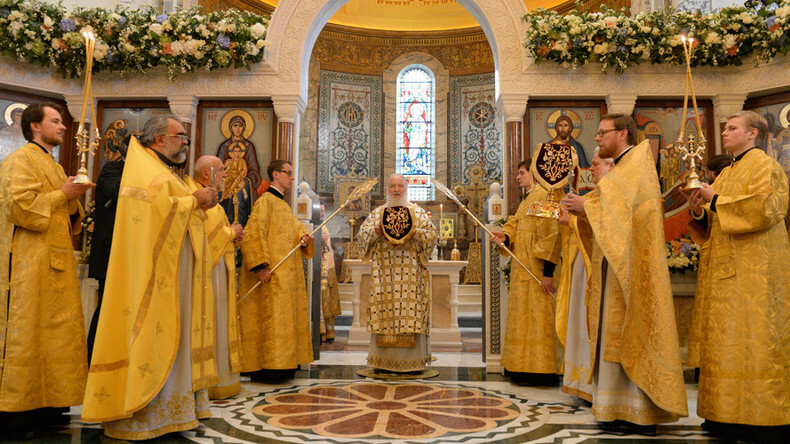 “It is a very significant [event] – these celebrations devoted to the 300th anniversary of the presence of the Russian Orthodox Church on the British Isles. It is important for us as there are about 46 Orthodox Christian parishes in the United Kingdom, and 60 years ago it was only three. […] More than 200,000 Orthodox Christian people are living in the UK. Patriarch Kirill is [there] to celebrate this great feast for all the Orthodox [Christian] community [with the UK’s congregation],” Father Georgy said.